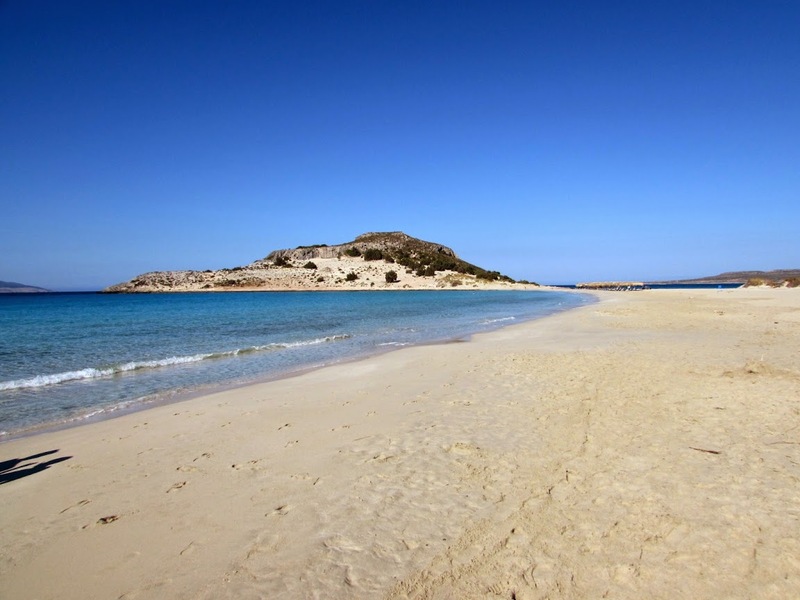 The small Elafonisos Island is undoubtedly one of the most precious jewels of Greece, especially for lovely and secluded beacheas where you can cut a corner for yourself. 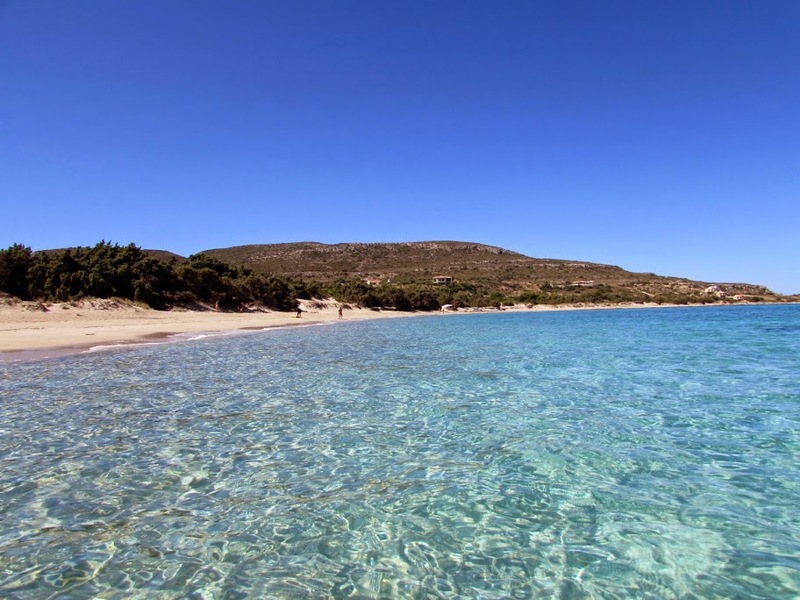 Reach it is not easy: the island is located in the extreme southeast of the Peloponnese in Laconia region; the closest airport, Kalamata, is about three hours and a half drive, a road across switchbacks and rugged mountain scenery, as well as fifteen minutes by ferry. But those who decide to go this far, will find his lost paradise with, in my opinion, the most beautiful beach in the Mediterranean! 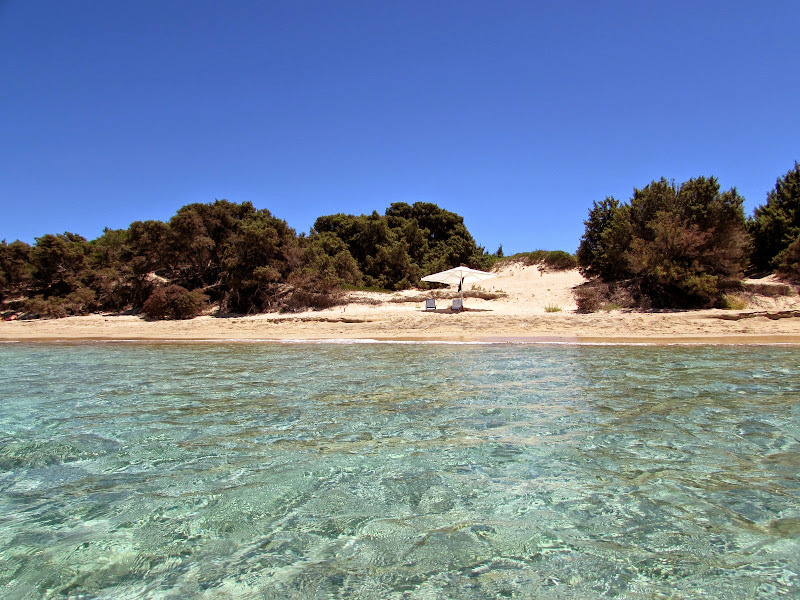 The island is small: a charming village where you can enjoy fresh fish, two beaches that are not easily forget, lots and lots of tranquility in a corner of untouched Greece. 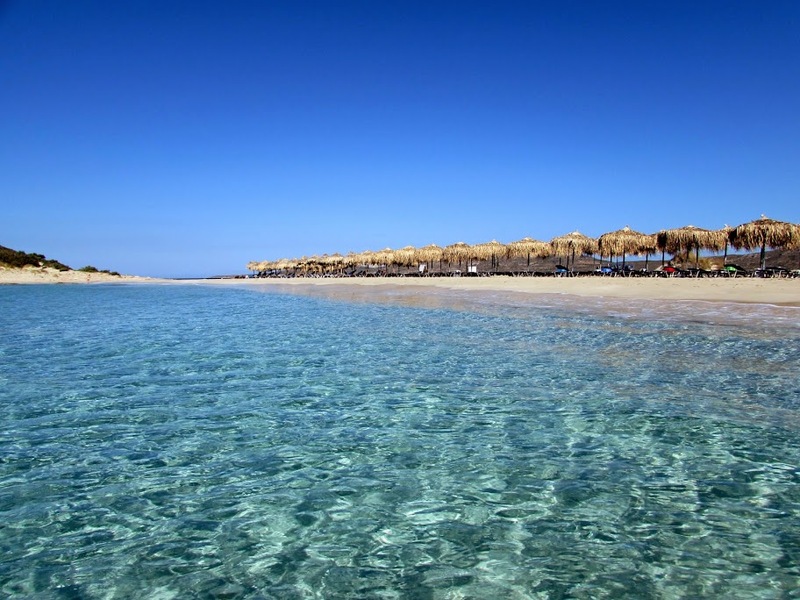 The most famous beach in Elafonisos, Simos, is located south-east: a thin strip of soft sand separates two sections of the sea from the intense blue and the unparalleled transparency. The east side beach is the smaller and more sheltered from the wind, with a beautiful lagoon often calm. The west side beach is endless, a couple of kilometers long and almost deserted, except for a couple of small umbrellas rental. Here the winds blow stronger and the sea remains agitated, always maintaining a cristal clear water. You can get on the small promontory to admire a beautiful view across the bay: do it after noon, the colors are a delight! An umbrella with two / three beds costs 8 Euros for the whole day. The best part of the beach is near the sandbar, accessible from the parking lot in less than 10 minutes' walk. 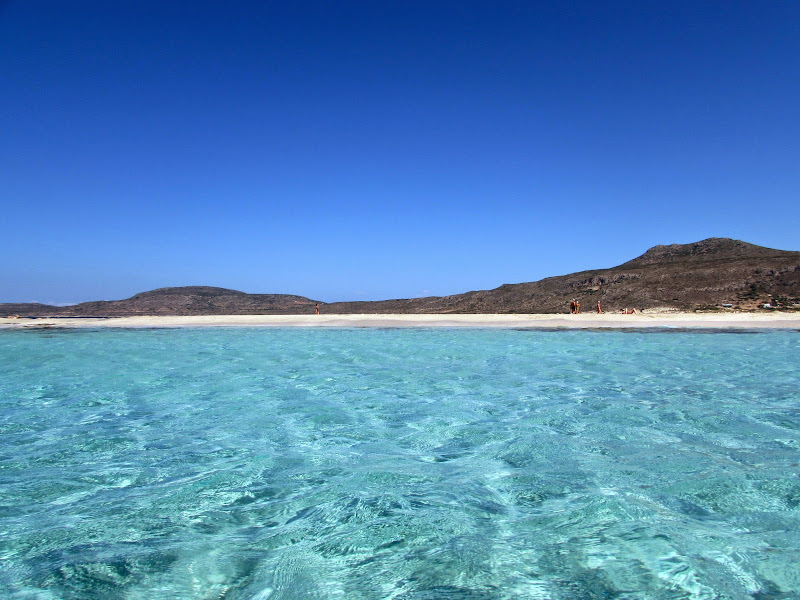 The smallest Panagia beach is of on the opposite side of the island: the sand is less white than Simos, but the colors and transparencies of the sea are still a charm! 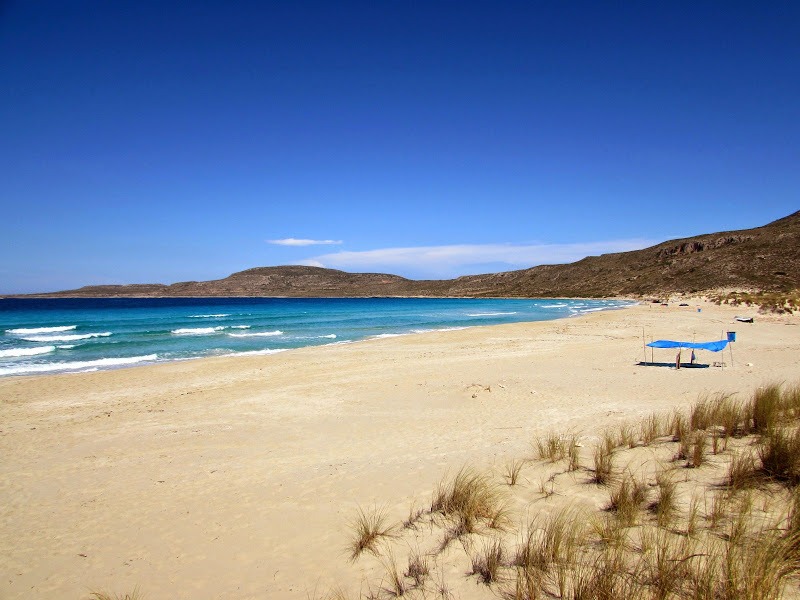 The first part of the beach is equipped with a couple of small rentals (€ 8 umbrella and two chairs), but away from the central part are beautiful deserts landscape. Parking is convenient, right off the beach where there is also a bar-tavern. The familiar and small Berdoussis Hotel is a gem, where the care and attention to detail will impress you from the first moment. The hotel looks brand new, rooms and common areas are immaculate and carefully chosen furnishings. Each room, very spacious, has all comforts and a private terrace, good wi-fi signal and well appointed bathroom. Breakfast is served on the lovely shaded terrace and dishes are quality and presented with care: homemade jams, cheeses and local products, fresh fruit. The location is quiet, on the edge of the village, but two minutes walding from the harbor and restaurants. Price paid for triple room with breakfast € 85. 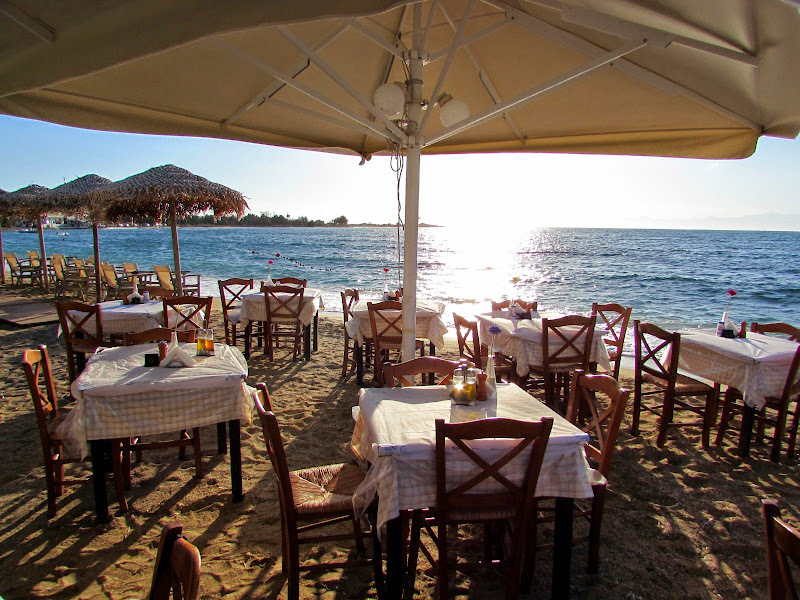 After trying the restaurant of legendary Peter on the first night, we have not moved from here; I do not know quality for the other restaurants, but you can hardly eat better that O Boukas Fish. However, prices are now slightly lower than those found at the port and this is already a good reason. 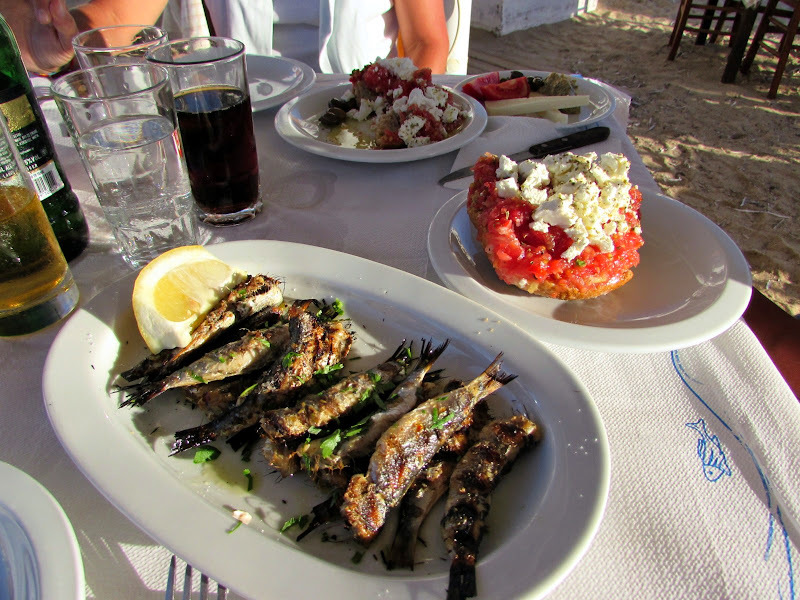 Do not miss the spaghetti with octopus, the delicious moussaka (never eaten so good in another Peloponnese), the baked feta with paprika and chilli. Magic atmosphere just steps from the sea on the beach. O Boukas Fish is on the opposite side of the harbor: the little church looking the sea, go left until you turn the side, here it begins the town beach and the restaurant is the first you come across. Unfortunately no longer it is trafficking Ryanair flying to Kalamata. 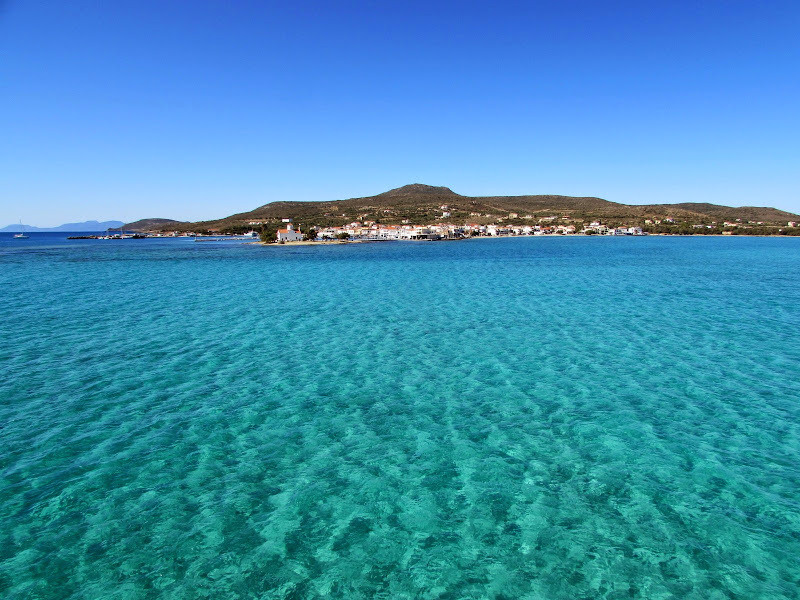 Therefore, at th moment it is necessary to fly to Athens which is 350 km (4 hours) from the small port of Pounta Vigklafia . From here, a continuous ferry service connects the island in 15 minutes, he runs every half hour / hour and you can ferry with your own car. The tickets are made directly to the dock in a minute. Cost: € 1 per passenger, € 10,50 per car one way. 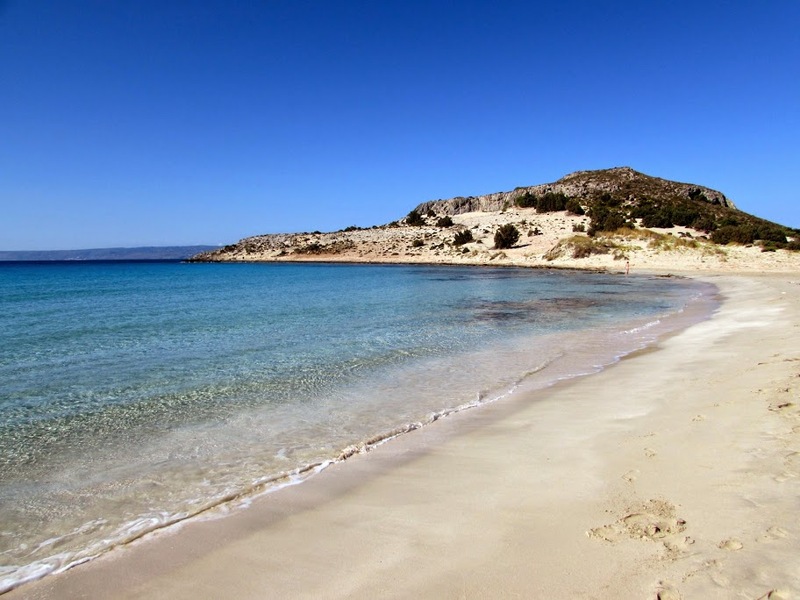 You can not drop to Elafonisos any rented car in Athens, will therefore also rented for the duration of your stay on the island. 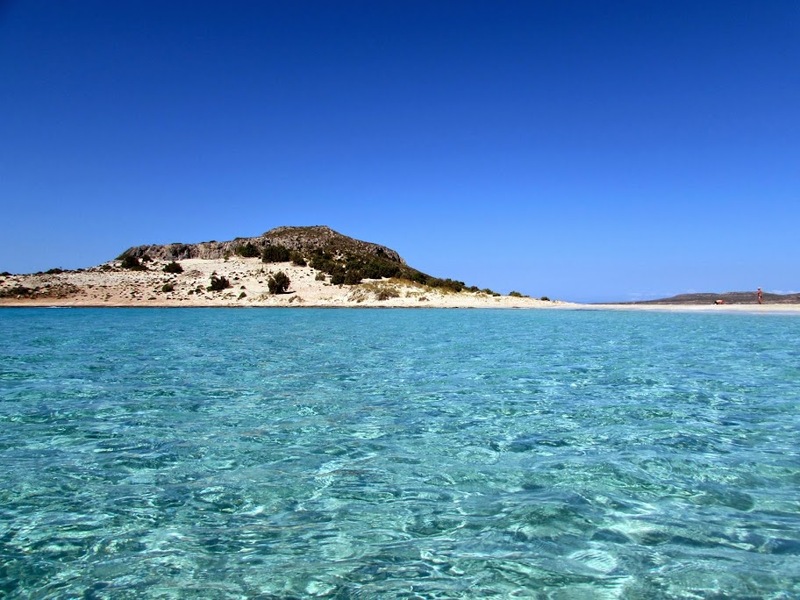 The alternative is to get to Patras by ferry from Italy, which is 370 kilometers (about 5 hours) from Pounta Vigklafia . 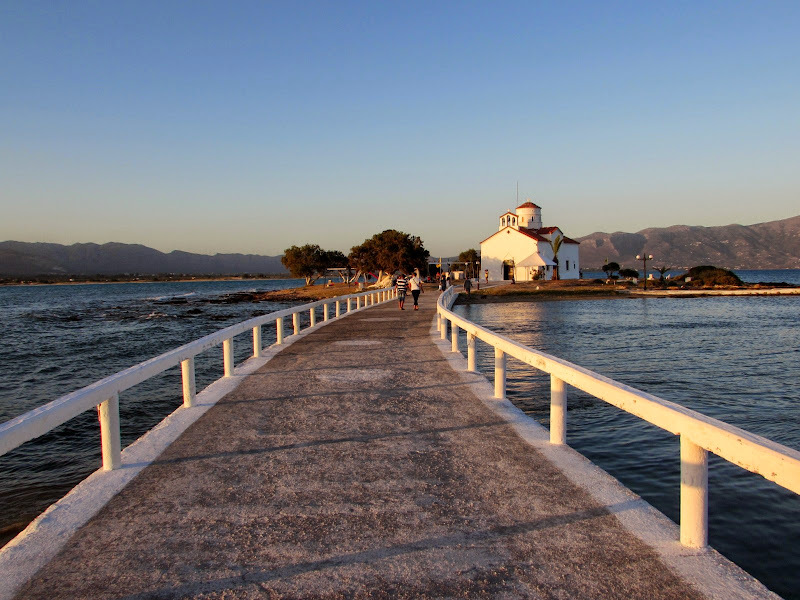 Obviously, the advice is to plan some stops along the way to discover the Peloponnese's beauty.